Situated on the top floor of a period building this well presented studio flat is bright and modern throughout and is ideally located for local amenities. The open spaces of Eel Brook Common are moments away while Fulham Broadway is close by for a range of leisure facilities, shops, bars and restaurants. 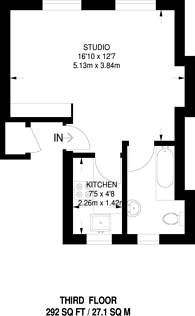 292 (27 Sq M) approx.